This recipe has been filled with pitfall after pitfall. But I'm placing my faith in it tasting better than it currently looks. Please keep your fingers crossed for me. 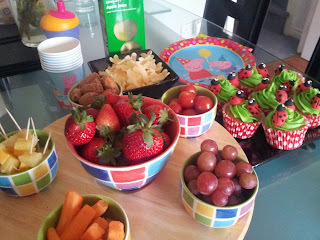 If you're a regular follower, you'll know I'm on a bit of a baking jag this week to mark Miss A's second birthday. We've had a Hummingbird Bakery cupcake dachshund, Mary Berry's Iced Gems, ladybird cupcakes (I did end up using the Mary Berry vanilla cupcakes that I froze as I didn't get time to bake any more) and finally the big cake for tomorrow. Originally I was going with chocolate, but having been left cold by Nigella's Chocolate Fudge Cake, I was inspired to switch to lemon after reading about the celebration cake the lovely Maria Kelly made to celebrate the half way mark of her blog Maria's Kitchen. I met Maria through Twitter and she's on a mission to try one new elaborate bake each week for a year. She bakes, photographs and eats some amazingly stunning cakes. I'm hoping that she'll open a tea room soon after the challenge and send me a VIP invite. Her cakes make me want to lick my screen. Anyway, hop over and read her blog (lemon cake is week #26) and make sure you look at the recipe section for the low down on how to recreate the bakes. The lemon cake is well documented and I was really excited to give it a go as Maria's looked so amazing. But of course, I tried to fit mine in after a full day at work, with an Ocado delivery in the middle and an egg-cracking child desperate to root through said shopping to see if I'd bought any more eggs for her to crack and then having to cook the husband's dinner before the cake could be baked (after it was already mixed) and get it all in the oven before the football started. Stressful. My first failure was to not make sure the lining in the tin was straight so consequently, there's a huge dip on one part. 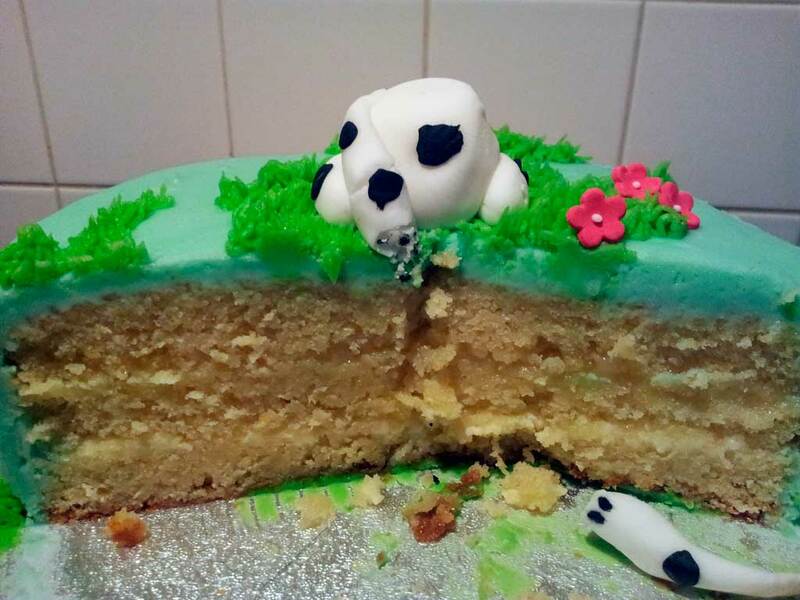 Thankfully, turning the cake upside down and slathering lots of buttercream on it has hidden the worst of the damage. Secondly, I forgot to take a picture of the baked sponge. It looked beautiful. As I don't own a 15cm tin like Maria, I upscaled the recipe by a third to fit my 20cm tin. Miss A was happy as she got to crack four eggs rather than three. It got syruped, sliced and cooled and the first layer of buttercream is on and it's now chilling in the fridge. Of course, a flat buttercreamed sponge doesn't take a good photo. So you'll have to wait until tomorrow morning when I've finished decorating for a picture and then a further pic will be posted with feedback on the taste test later tomorrow. With the syrup, the recipe doesn't tell you to heat it but I was worried about the crunchy texture making the icing all knobbly (forgot that the buttercream layer would disguise this) so I heated up my sugar and lemon and reduced by a third to make a thick, sticky syrup. Final mistake was when I re-layered the sponge after filling with butter cream and lemon curd, I forgot to make sure it was flat on the top. Consequently, it's a little uneven but hopefully the decorations will hide that. And after all, it's only being judged by a toddler and my greedy family who will all say nice things even if it looks rubbish. On this occasion I will choose not to request the husband's feedback. If it's really that amazing, he'll tell me. If not, I just don't want to know. 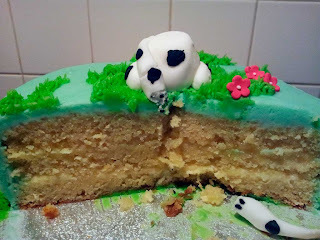 Anyway if you want some amazing pics of this cake, hop over to Maria's blog and give her a a follow on Twitter too. She's ace. When I posted last night, the cake was merely covered in sky blue buttercream. This morning, I got up early to decorate it with a doggy theme. There was a minor disaster when the sugarpaste dog I crafted the other day had stuck to the plate he's been living on and disintegrated as I tried to prise him off. Cue frantic rush to make new doggy before Miss A got up. 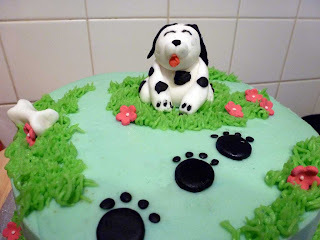 I had originally planned to ice with white regal icing and do a dalmatian themed cake, but after making the original sugarpaste doggie, I just wanted something a bit more fun. So with my new grass icing nozzle and some pink sugar flowers, the cake became 'Dog in the garden' instead. Although I'm not artistic, everyone (including the husband) recognised it as being a dog and Miss A's face when she saw the cake was a picture. A moment I will definitely treasure. When it came to the cutting and eating of the cake, I'd become so fond of my creation that I was reluctant to let it go. But Miss A dove straight in there the second the candles had been blown out and ripped poor doggie's head off and popped it in her mouth. She quite clearly gets her sentimentality genes from her father. 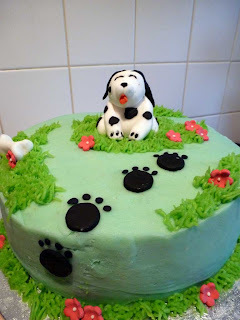 If it was up to me, doggie would've been removed from the cake and left to live somewhere in the kitchen until he got too dusty. I'm a sucker for anything animal shaped that's edible. I have an Easter rabbit still in its box from when I was gifted it some twenty-five years ago (obviously I was just two at the time!) because I couldn't bring myself to unwrap and eat him. The biggest surprise of all was when the husband said 'It was a really lovely cake'. It took me about ten minutes to compose myself after this comment. If you're a regular reader, you'll know that his criticism really bites. If he liked food and was a restaurant critic, he'd be likened to Anne Robinson crossed with a Rottweiler. In fact, his damning criticism of my attempt at Mary Berry's Hokey Pokey Coffee Cake nearly put people off entering the Weekly Bake Off challenge a few weeks back. It's definitely on the make again list although I would tweak it slightly. And here's what I'd do and why. 1) I used shop-bought lemon curd. Although I used a good quality one (Waitrose) it still wasn't quite sharp enough to contrast with the huge amount of buttercream so I'd probably make my own again if I had the time. 2) I would definitely use regal icing as the amount of buttercream was just too sweet. Or, I would try to remember to add a touch of salt to the buttercream - I use unsalted butter and I think just a touch would take the edge off the sickliness. 3) The drizzle was great but for me, it didn't sink right in. Maybe because I heated mine up to a syrup. And as I turned my cake upside down to try to disguise the big missing lump where I didn't get my baking paper straight, all the good lemony drizzle bit was at the base of the cake. So if I did it again, I'd probably drizzle both top and bottom. Grease and line a 20cm round tin and turn oven to 180c/160c fan/Gas 4. Beat the butter and sugar together until light and fluffy then add the rest of the ingredients and mix to a fairly runny mixture. Bake for 1 hour (surprisingly, my cake was done after an hour when the smaller cake took 55 mins). Meanwhile combine the granulated sugar and lemon juice for the glaze. Heat in a small saucepan until reduced by about a third. When the cake is ready take it from oven and skewer it. Pour over the syrup and allow it to cool in the tin. Prepare the butter cream by first beating the butter for 1 minute then add the icing and mix carefully at first. Mix in the vanilla beans, then the lemon curd. When the cake is completely cold, place in the fridge for 30 minutes to firm up - this gives it a firmer texture for slicing which works really well in warm weather. Remove from the fridge and slice into three layers. Spread the bottom layer with lemon curd. Replace the middle layer and spread this with a thin layer of buttercream. Add the top layer and then use around half of the remaining buttercream to ice the top and sides of the cake. Refrigerate for thirty minutes and then use the buttercream to coat a second time for a smooth finish. Wow, I love the theme! I think it's a gorgeous cake.